EDIT:Some how I wound up with 2 of the first Pic, so scroll down & u'll find the third pic also, sorry.. I've got 2 screen shots I need u to clarify if u can please? This first pic came up when I had a couple of tabs already opened so I don't know when it first appeared. I was thinking it may be a fake...do u know if it's phoney? 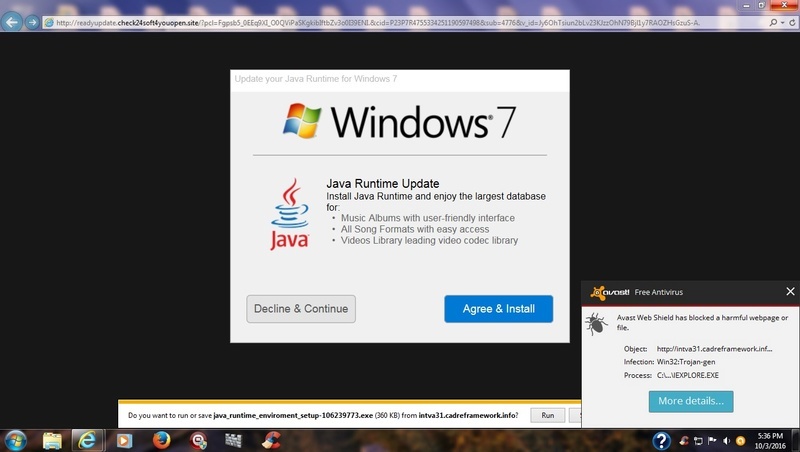 This 2nd pic shows the Avast BLOCKED webpage, & is it pertaining to the Java update being a fake? 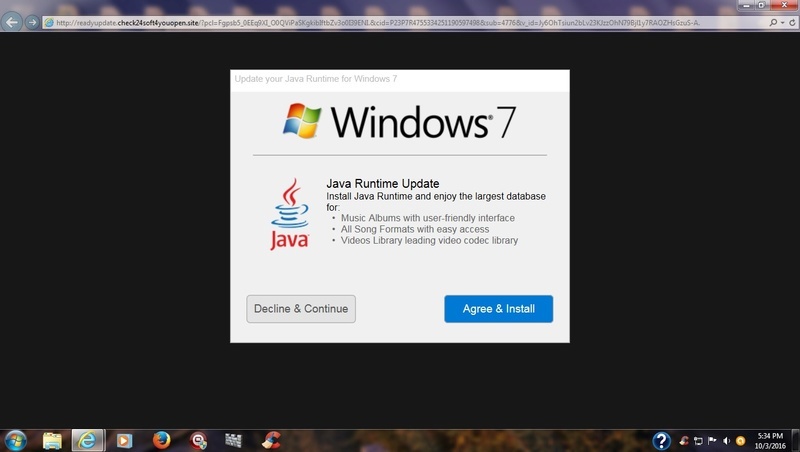 Hey, I just remembered something I haven't had Java for several years... ever since java had all that trouble that time...so this update offer has to be fake & related to the Avast Blocked webpage....am I correct? 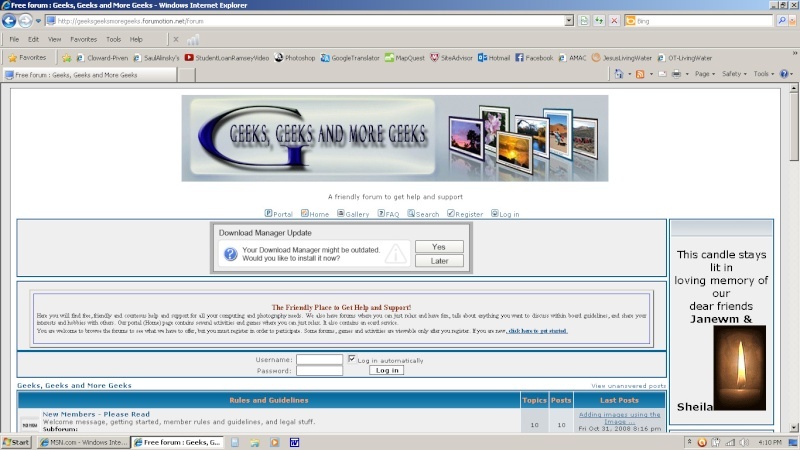 That is a fake website - look at your address bar at the top of the page, readyupdatecheck24soft4youopen.site. How did you get there? It isn't coming from Java.com or Oracle.com, the only official websites for Java. Looks like Avast blocked the download. Better run Malwarebytes and SuperAntispyware just to make sure. EDIT: Scans found nothing on either Malwarebytes or SuperAntispyware As I said I don't know how that page came up....I didn't realize it was a webpage as I'd never seen a page like that before...so, I guess no harm done, Right? what do I need to know about running adwcleaner? Do I just click on "Run", or "Start"or something similar? Do I "Scan" & "Clean". I'd appreciate an heads up? If you don't already have it, download it onto your computer in a folder of your choice, like My Downloads. Click on it and an window will open. Click Run. Another window will open. Click Scan and let it run to completion to see what it finds. If it finds anything, use the Clean button to get rid of what it finds. If you aren't sure that you should remove what it found, post what it finds here and I'll take a look. Be sure to run ccleaner before running adwcleaner. 1. I'm just seeing ur reply.....I've got in my downloads adwcleaner, created 8/13/2015, last year, version 4.2.0.8, will I be able to use this version, or will I have to download again? 2. When adwcleaner is run, do I need to close browser so it can run alone, or can I do other things while it runs? Should be able to run that version. If it won't run, it will tell you so and prompt you to download the latest version if I remember correctly. It may ask you if you want to get the latest version, and you can decide whether or not to run the version you have or get the newest version. If you get the newest version, the old version will disappear from your folder. Close all other programs, browsers that you opened and let adwcleaner do its thing. It doesn't take very long to run. 2. After ur reply, all I have to do is run adwcleaner again to then follow ur instructions on what to do about the "Threat", CORRECT?? 4. EDIT: Not sure what to do while posting this here, so, I unchecked the box next to the threat, to save it, that's what it said if I wanted to save item....Now, I'm thinking that I might have needed to place it in "Logfile"? What should I have done with the scan? I can't tell anything from that screen shot. You need to place your cursor on the line next to value in the bar above the Key. The cursor should change to a + with 2 horizontal arrows pointing left and right. Left click and drag it to the right as far as you can go to expose the entire key description. If some is still hidden, move the sliding bar at the bottom of adwcleaner to give more space and then drag the bar above some more. Keep doing that until the entire KEY is exposed so I can see what registry key value is. If you don't know what to do from the description I just gave you, just make a new restore point to come back to if needed, click the Clean button, and pay attention to how your computer behaves. If it isn't working right, you can always go back and restore to what it was before running adwcleaner. Are you able to get the win updates? it can't be expanded, so I found it in the log file...I'll post my screenshot for you..
Scroll down to the "Key" for the complete description. I assume it could be placed in quarantine if necessary? Please let me know what to do. Sorry about not getting back to you sooner. I was looking for a solution to your Windows Update problem as I was having the same problem. I don't know what that HKCU item is, can only find that others have found it. Probably junkware. Set a restore point and then rerun adwcleaner and click the Clean button to delete it. Watch to see that your computer hasn't been affected. If it acts strange, you can always restore it back to before you deleted this. 1. Set up a new restore point. If both of these KBs are on your system, then skip to step 5. If one or both are not on your system, then continue with step 4 below to install it/them. Click on it to run it. Follow the prompts and when you see the check box for “Run aggressive options (not recommended)”, ignore the “not recommended”, check the box next to it and continue to follow the prompts. When the application has completed, repeat Steps 4-5 above unless Step 4 was completed successfully previously; if Step 4 was successful, then repeat Step 5 above. QUOTE: I don't know what that HKCU item is, can only find that others have found it. Probably junkware. Set a restore point and then rerun adwcleaner and click the Clean button to delete it. Watch to see that your computer hasn't been affected. If it acts strange, you can always restore it back to before you deleted this. 1. I've never been able to do a "System Restore" since I've had this computer and System Restore changed or something...u may recall that I tried on many different occasions when I was having other problems of some kind & I never could get System Restore to work for me. 2. RE: Adwcleaner: So, Instead of a new restore point that I might not be able to Return to, wouldn't it serve the same purpose, when Adwcleaner finds it again, couldn't I just Quarantine it, and watch for any strange computer behavior? Note that there is a space between sfc and /. Let it run to completion. 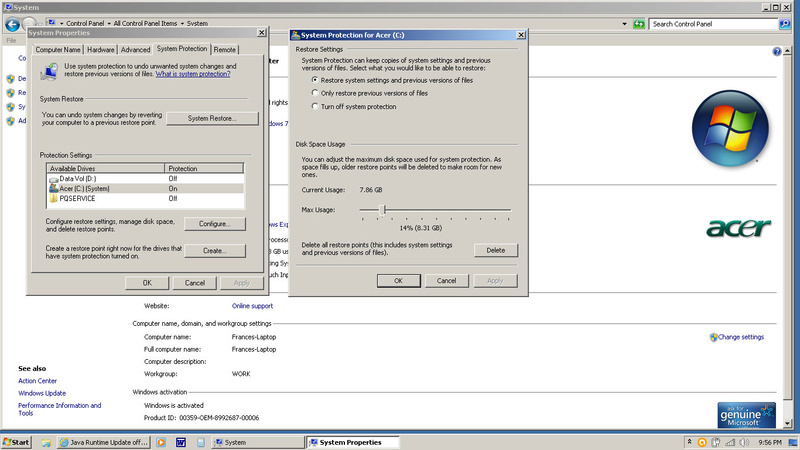 After completion, try running System Restore from the "Repair your computer" window. If it doesn't complete successfully, sometimes a second run will complete successfully. Question 2: I think once you delete something in adwcleaner, it is gone - no quarantine that I know of, but haven't deleted anything in a long while, so not sure about that. 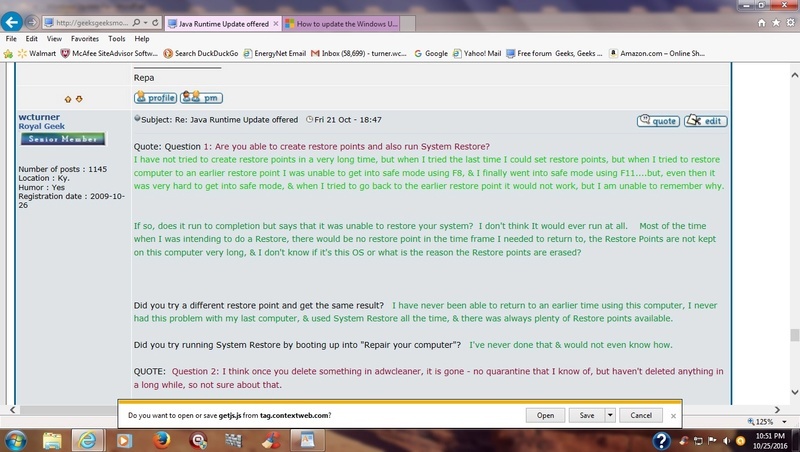 Quote: Question 1: Are you able to create restore points and also run System Restore? I have not tried to create restore points in a very long time, but when I tried the last time I could set restore points, but when I tried to restore computer to an earlier restore point I was unable to get into safe mode using F8, & I finally went into safe mode using F11....but, even then it was very hard to get into safe mode, & when I tried to go back to the earlier restore point it would not work, but I am unable to remember why. If so, does it run to completion but says that it was unable to restore your system? I don't think It would ever run at all. Most of the time when I was intending to do a Restore, there would be no restore point in the time frame I needed to return to, the Restore Points are not kept on this computer very long, & I don't know if it's this OS or what is the reason the Restore points are erased? Did you try a different restore point and get the same result? I have never been able to return to an earlier time using this computer, I never had this problem with my last computer, & used System Restore all the time, & there was always plenty of Restore points available. Did you try running System Restore by booting up into "Repair your computer"? I've never done that & would not even know how. QUOTE: Question 2: I think once you delete something in adwcleaner, it is gone - no quarantine that I know of, but haven't deleted anything in a long while, so not sure about that. 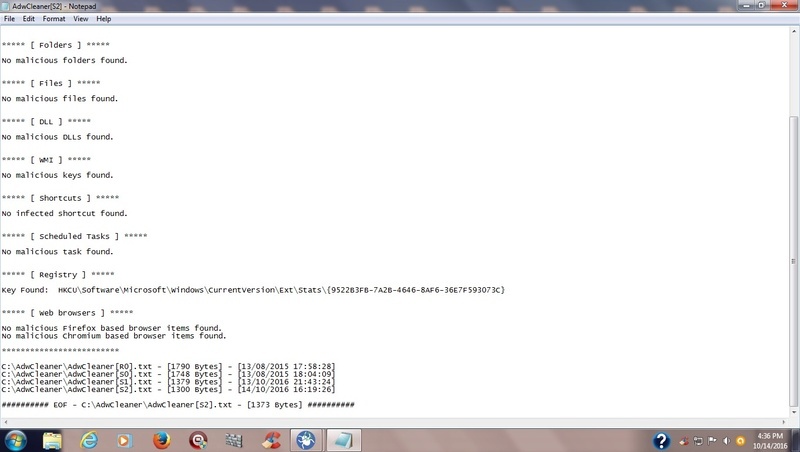 It has a quarantine, you click on "Logfile" when that opens it is in the top of the window that opens. Ok, if adwcleaner has a quarantine option, then go ahead and let it delete that registry entry. I am puzzled about what you are telling me concerning system restore. Are the buttons "grayed" out so that you can't click on them on the system restore menu? 2. Select the System Properties tab and then click on the Configure Button. Click Start > Control Panel > Administrative tools > Services. The Services window will open. Scroll down to "Volume Shadow Copy. Check to see that the Status = Started and Startup Type = Automatic. If not, double click on Volume Shadow Copy and set those values accordingly in the popup menu that appears. 1. It looks like it will take a very long time for me to get the Windows Update & adwcleaner Instructions done, if ever. Not only am I having a very bad time with my health these days, but as usual when trying to do anything with the computer, something else happens to make completing the task more difficult. 3. Make sure you view the very bottom picture that appears as some type of a download trying to install...I keep clicking CANCEL to get rid of them. When all this stuff appeared, I just went to the Microsoft website, my Duck search engine, & here at geeks, just back & forth. Is that a virus? What do I need to do, please? 4. I won't try anything else until I see your reply about this. 5. I forgot this screenshot shows where I was taken to this webpage when I tried to close all my browser tabs. WC, your computer is screwed up. It looks like you have a browser hijacker that is taking you to a very malicious website (Downgradepc.readysoft4youopen.top) instead of Microsoft. That could be what adwcleaner found. It could also be a bad entry in the Hosts file, but it would have been put there by malware. You can either rerun adwcleaner and delete whatever it finds and go through the complete procedure in Tut#6 in the Tutorials forum, or, save yourself a lot of time and heartache and take it to a shop to get it cleaned up. If you take it to a shop - and I recommend that you do given your health and the problems you have with the computer - make sure you tell them to make sure system restore and windows update are working before giving it back to you. 1. The Avast popup said that Downgradepc.readysoft4youopen.top "The Infection was Blocked"....what about that? 2. I assume I better not use the computer except to come here to geeks, is that correct? 3. What else, besides what you mentioned in your last post, would I need to tell a computer shop that they would need to know in order to clean up this computer? 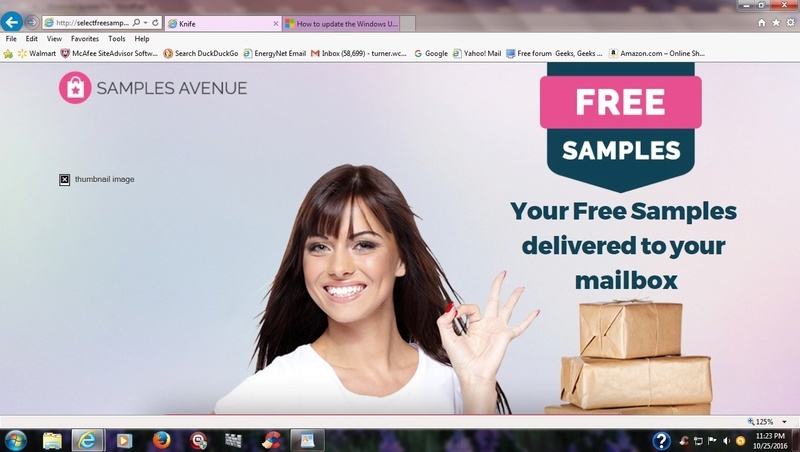 It blocked the bad stuff that was being downloaded, but it didn't block the browser hijacker that sent you there. That's probably what adwcleaner was wanting to delete. Copy and save any files and folders you don't want to lose to a DVD and take your computer to a shop and tell them what I told you above. Give them the same information you gave me as to what you are experiencing. Tell them also to make sure they check the Hosts file for bad entries. Make a hardcopy of the stuff you posted above and take that with you. Please refresh my memory, or let me know if what I am going to ask u next is correct? 1. To make a hard copy don't I just place a blank DVD in the computer Tray & follow the prompts to make the hard copy? At least that's all I can remember about how to make a copy? 2. What about this, I'm thinking about reruning adwcleaner & putting it in Quarantine, & see if that helps? What do u think about doing that? 1. to make a copy of your files or folders, just right-click on them, select copy, go to your DVD and select paste. After you are done, you'll get prompt that you have a pending action to complete. I haven't done it that way is so long that I don't remember the details off-hand without trying it. Better yet, if you have a USB Flash Drive, that would be the easiest thing to use. If not, you can get a 32GB Flash Drive at Staples for $13.99. That has so much more space than a DVD and is very handy to have. Just plug it into a USB port, your system will find it, and it will look like another drive on your computer. You can just drag files into it, or copy and paste just like you do on your current drive. It's very easy to do. 2. Yes you can try rerunning adwcleaner and see if that gets rid of that browser hijacker. I also suggest you run Malwarebytes and SuperAntispyware at a minimum afterwards, and delete or quarantine anything they find. But if that website or that advertisement page comes back when repeating those tasks that caused them, save yourself some grief and take it to a shop.